Input: USB 5V (USB1 or USB2). Output: 5 VDC VUSB not protected and 3.3 VDC regulated/protected up to 500mA. Two MicroUSB ports (1 OTG and 1 Device/Host) with ESD protection. MicroSD slot with 4bit SD and SDIO mode support in hardware (up to 48MHz about 24MB/s). Reset & User Button with User Led (can be disabled to reuse I/O for other stuff). Breakout of all 44 I/O (some are used by MicroSD and USB1). Programming firmware through USB DFU (without any debugger) with USB1 FS. even using a 2nd HydraBus with Black Magic Debug firmware for HydraBus more to comes about that). 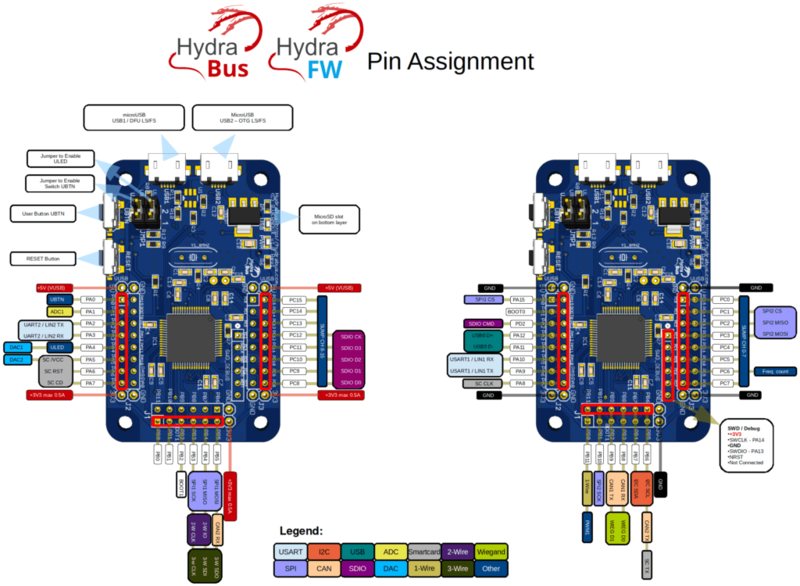 HydraBus Shield Template is available on GitHub (CadSoft Eagle 6 files) fully open source (CC BY-SA 4.0) for Hardware maker to build your own extension using Eagle 6.x. Almost all I/O are 5V-tolerant (except PA4/PA5 for DAC_OUT & ADC functions which are 3V3 only). MCU ARM 32-bit Cortex M4+FPU up to 168MHz (with power consumption of less than 100mA/3.3V with all peripherals enabled).